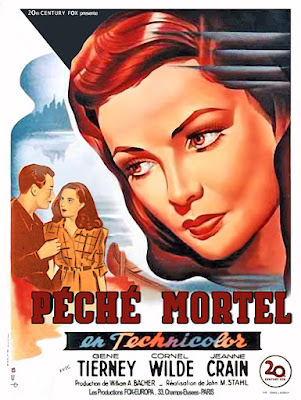 Today, I'm reviewing the classic film noir Leave Her to Heaven (1945), starring Gene Tierney. 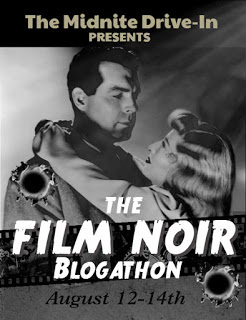 This article is part of the The Film Noir Blogathon hosted by The Midnite Drive-In. As most classic movie fans know, film noir was a genre that thrived in the shadows. Most noirs were relatively low-budget, black and white movies that focused on the mean streets of an urban America filled with crooked cops, cynical private eyes, and deadly femmes fatale. However, director John M. Stahl's classic, Leave Her to Heaven (1945), takes the genre out of its shadowy surroundings for a Technicolor masterpiece filmed in the great outdoors that stars Gene Tierney as a beautiful woman with a dark soul. Leave Her to Heaven begins when writer Richard Harland (Cornel Wilde) strikes up a mild flirtation with the beautiful Ellen Berent (Tierney) while they are both on a train to New Mexico. Ellen, who has recently lost her beloved father, sees Richard as his replacement in her life, and she quickly escalates their relationship; in fact, she dumps her fiance (Vincent Price) only a few hours after meeting Richard, and she proposes to him after they've only known each other a few days. The couple soon settle into what seems like domestic bliss in Richard's cozy cabin in the Maine backwoods until he finds that she is obsessively jealous of anyone else in Richard's life, including her own adopted sister (Jeanne Crain) and Richard's disabled younger brother (Darryl Hickman). Leave Her to Heaven was based on a sensational novel by Ben Ames Williams that was one of the hottest bestsellers of 1944. 20th Century Fox chief Darryl Zanuck quickly snapped up the films rights for a planned adaptation starring Tallulah Bankhead as Ellen and Ida Lupino as her sister, but that version never came to fruition. 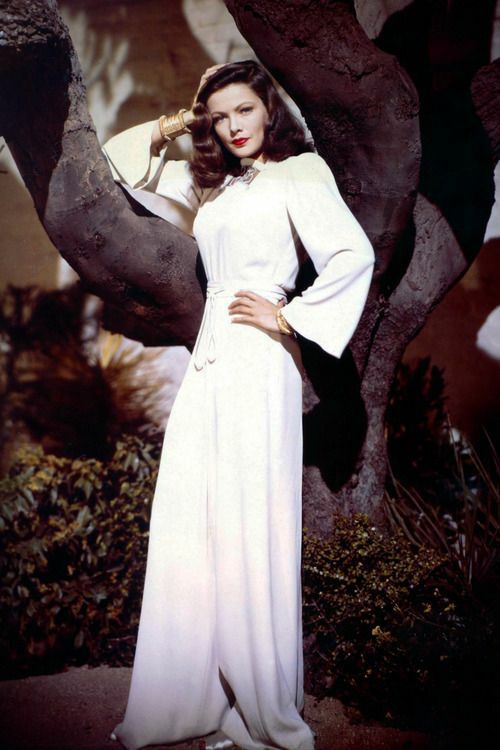 Instead, Zanuck decided to capitalize on the popularity of Tierney, who was one of the most sought after actresses on the Fox lot thanks to her starring role in the noir Laura (1944). Fox pulled out all the stops for Leave Her to Heaven, filming on location in Arizona and Big Bass Lake in California, which stood in for Maine. The result was a massive hit that won one Academy Award for best color cinematography and was nominated for three more Oscars, including Tierney for best actress. The movie was Fox's highest grossing film of the 1940's and Leave Her to Heaven, along with films like Double Indemnity (1944) and Scarlet Street (1945), solidified the popularity of the "murder-mysteries," which is what the industry called noir at the time. Gene Tierney takes a break on the set of Leave Her to Heaven (1945). Today, Leave Her to Heaven is considered one of the best noirs ever made even though its outdoors locations, Technicolor photography, and focus on female characters isn't typical of the genre. Most noirs take place in shadowy urban jungles, but Stahl and cinematographer Leon Shamroy achieve the same feeling of inevitable doom in the the bright sunshine of the American West -- the beautiful Southwestern canyons accentuate Ellen's odd behavior when she first meets Richard -- but the use of location photography is especially effective in the famous drowning scene, which was filmed on Big Bass Lake in the Sierra Nevada Mountains. Leave Her to Heaven is also unusual because of its focus on female characters. Most noirs place complex, cynical antiheroes at the center of their films, but that's not the case in Leave Her to Heaven. While Richard is clearly the protagonist, he is anything but complex and cynical; in fact, he remains rather naive about Ellen's true nature. He views her instant obsession with him as flattering rather than bizarre, and he is oblivious to the massive hints about Ellen dropped by her family and friends. Instead, Leave Her to Heaven's driving force is the complicated Ellen, who hides her heart of darkness under a beautiful facade. Ellen is clearly a femme fatale, but she is also so much more than that. Most femmes fatale scheme their way into the hearts of poor saps so they can get some quick cash -- see Phyllis Dietrichson (Barbara Stanwyck) in Double Indemnity or Kitty March (Joan Bennett) in Scarlet Street -- but Ellen, who is independently wealthy, wants more than that from Richard. She wants to possess Richard body and soul, and she will do anything, including kill her unborn child and plan an elaborate scheme from the grave, to achieve her goal. Leave Her to Heaven will air at 4 p.m. Oct. 2 and 6 a.m. Oct. 19 on TCM. It is also available on DVD. Love your blog and your wonderful writing! Can't wait to see this great movie again soon. Ellen! That character and Tierney's portrayal can make you want to leap through the screen and strangle her. Powerful stuff. Actually, the more I think about it, I'd like to leap through the screen and live in that amazing ranch house and Back of the Moon. As always, insightful and readable article. An interesting addition to the blogathon to say the least. I haven't seen it, but I'll try to find it. This is a most unusual noir for all the reasons you mentioned – colour, location, types of characters – which makes it all the more haunting, in my opinion. I always find it jarring, that such evil can take place in such gorgeous surroundings. Yes, this movie reminds of a Sherlock Holmes quote where he says something like more evil takes place in the countryside than in London because there is so much isolation. This is one of the best- but I agree that you must have a certain taste to enjoy it properly. 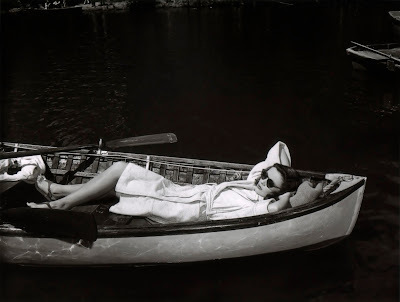 Its just so different than the other noirs and I like that- I wish Tierney would have won- she deserved it- THAT LAKE SCENE- How could she have lost!!!?? She was up against Joan Crawford in Mildred Pierce, but it's too bad she never won an Oscar. She doesn't get the recognition she deserves as a great actress.